EASTERN TEXAS — It’s early on a Friday morning, and after three consecutive night shifts in an emergency room, Dominique Fontenette is free. As she wearily wills her car the two and a half hours to the airport, Dom dwells on the fact that she scheduled this heavy work week to give herself several weeks off to prepare for USAU Club Nationals. But that delight only stretches so far on this Friday, where Dom can be found waiting on the tarmac for hours as her airline tries to fix her plane, or in Los Angeles, where her plane was diverted, or finally back home, in Seattle, at 10:00p.m., eight hours later than scheduled. But Dom was back. She “crinkled” herself out of the plane, as she put it, and went to a local haven of hers: a Chinese reflexology (a foot and hand massage technique with the goal of affecting the whole body) clinic. They’re open until 11:30 p.m., and Dom swings through a couple times a month for a $28 massage. It’s quiet here, and relaxing. And it’s the perfect primer for what’s next: driving home and sneaking in four hours of sleep before she jumps in a car to Lacey, WA, for Regionals. 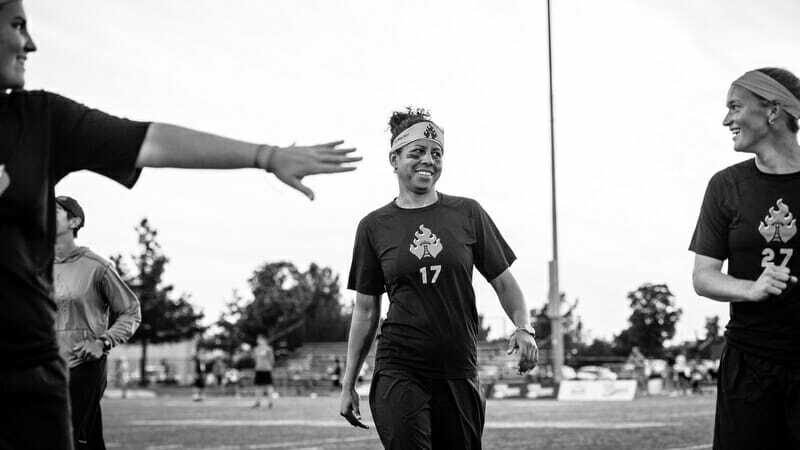 In the fall of 1993, Dominique Fontenette caught her first glimpse of ultimate frisbee after catching a light post square in the head while walking through Stanford University. In a few minutes, she would find sit down to gather herself in front of a group of women playing the sport. In a few months, she would be falling asleep with a frisbee in bed with her. In a year, she would play with her first club team. Two years after that, she would be voted by her peers as the best player in college, and her team would win the national title. Another two years later, she would win her first national club championship, and two years after that, her first international medal, silver, at the World Games in Japan. Starting as a defensive handler with elite athleticism and morphing into a cerebral offensive cutter, Dominique has seen all sides and levels of the sport. 25 years after running into that light post, Dominique is still in a daze. 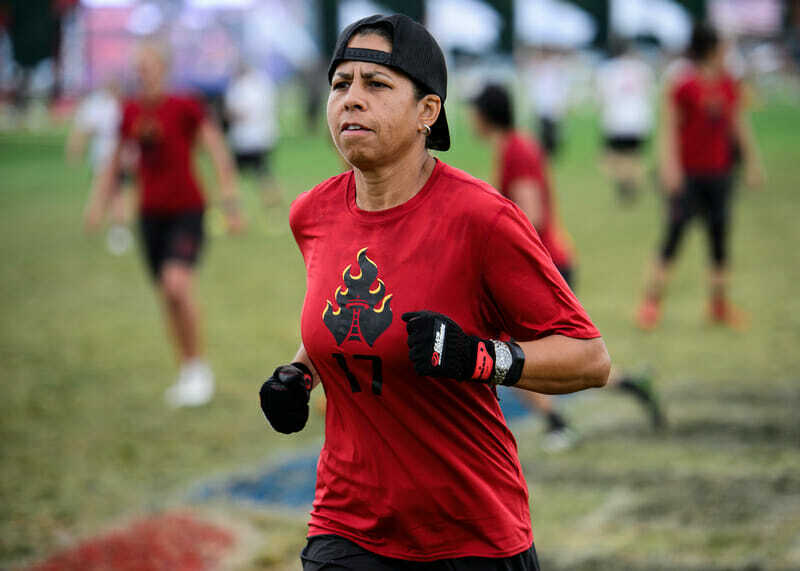 She was inducted into the USA Ultimate Hall of Fame this season, which, while a noticeable accomplishment, is a newly created award in a relatively new sport. Dom received an email informing and congratulating her, but nothing else for her accomplishment (but, as she says, “emails are forever 😉 ”). She wasn’t aware that she was eligible to get in. She wasn’t even sure how her teammates would respond to her receiving the award. Now, after some more time to reflect on whole thing, she’s honored. And she’s grateful to those who have been a part of her career, who’ve enabled her to do what she loves to do. The first person she mentions is her sister Angelique, who’s “truly an angel,” back home in Arkansas taking care of their parents. “She’s stayed there so that I can continue to be free to play and travel.” She named over a dozen other people when talking about her Hall of Fame induction, too many to list here1. But it’s not ‘just another year’ for Dominique. Amid a WUCC Championship, a bounce-back season after a wonky Nationals finish last year, and other elite ultimate events, Dom says it’s this family of friends that is most unique this season. TACOMA, WA — It’s a sort-of windy, sort-of rainy Washington weekend for USA Ultimate’s Northwest Regionals. Seattle Riot, undefeated so far at the tournament, was struggling to score. In a next-goal-wins scenario, Seattle received the disc and the advantage but couldn’t get very far with it. There were no turnovers or blocks, but there was pressure at every turn, and Riot had to squeeze every throw into just inches of space. After dozens of passes and a timeout, Riot was ten yards away from victory. While the pressure mounted and her teammates wrestled for yards, Fontenette swam across the field. She spent more time establishing the offense’s base in the middle of the field than she did trying to get open. When spaces were vacated, she took her turn, chiseling away at her defender, not with hammer and spike, but rather, the way water wears down the rocks of a riverbed: smooth, constant, natural; not commanding its way through obstacles, but gliding past them and around them in whichever ways it can. As the disc rushed past her, just a few feet away, Dom held her ground. 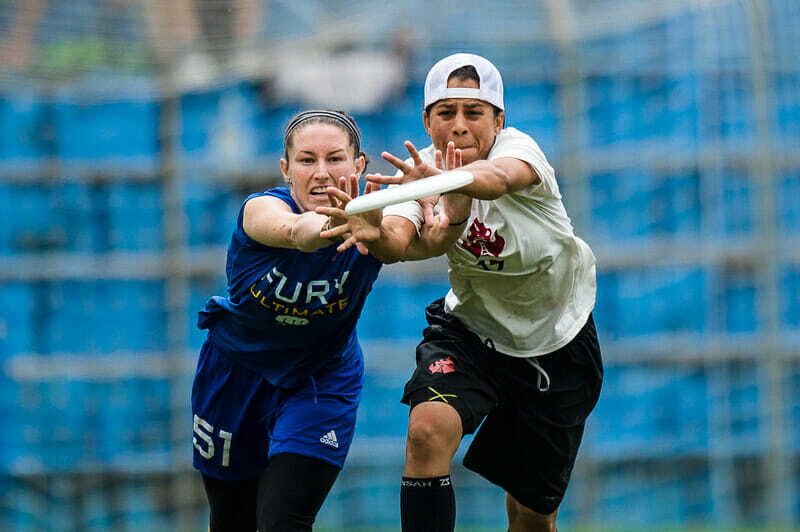 Her teammate received the scoring pass in stride, and slammed the disc into the torn and muddled field in an emotional display of satisfaction and pride. Her team had just qualified for Nationals, and after a long, hard battle against their opponents, Riot celebrated. As her teammates rushed past her, just a few inches away, Dom held her ground. She put her hands on her hips and consumed the events around her, and, for a split second, a smile flashed across her face, before she turned and walked away to join her team. SEATTLE, WA — With a Nationals-bound chunk of vacation in front of her, Dom got to doing what she seemingly does best: being the “on-call” friend, quite the contrast to her work life. “Whenever anyone feels like doing something cool they call me because they know I’m more than likely free or flexible enough to join,” she said. That week, while moving out of an apartment with one teammate and moving in with two others, she hopped on another plane so she could see a Lauryn Hill concert with Alex Snyder, Carolyn Matthews, Alicia White, and others. “The Reunion,” as they called it, saw tailgating, a three-hour delayed concert at the Red Rocks, brunch, a Supreme Court nomination hearing, hiking, happy-hour tacos and margaritas, and some pre-Nationals perspectives. After coming home, she met rookie Sam Rodenburg to drop-off what she couldn’t sell while moving; then she met with Rachel Bradshaw, who Dom calls “the best kept secret on Riot,” for another happy-hour session. Dinner with Rohre Titcomb, workouts at the YMCA with teammates, tea with former teammate Kate Kingery, happy hour with current teammates Calise Cardenas and Paige Soper, dinner with Underground coach Frank Nam, coffee with former teammate Heidi Marie, a Wednesday practice with Riot — all of this happening in just the 10 days after Regionals. While her schedule has been the biggest reason she’s become the on-call friend, there’s something else on her mind while she connects with all of these people: retirement. She’s 43 now, an age most could only dream of playing for club titles at, and she still plays a big role on an important group on this World champion team. And right now, that’s where her focus is. Or, it will be soon. “I’ll be ready for Nationals when I get to Nationals. I still have a lot of grooming to do. So no…I’m not yet ready for Nationals,” she says. And that’s where we find Dom now: 100% in. Maybe she’ll find herself talking to Wooten again this weekend. Maybe she won’t. She’ll be around and on-call in coming weeks and months, but when the 2019 club season comes calling, will she answer? Maybe. Or, just maybe, she’ll be surfing. Comments on "Indomitable: Dominique Fontenette’s Hall of Fame Career Continues"